This page lists a series of nearly 100 game fishing articles, written over the years, on memorable fishing days and nights, fishing devices, fly tying patterns, sometimes simply random thoughts on a fishing related topic. The subject matter, then, is varied but focuses particularly on fly fishing for trout, salmon and sea trout in Scotland, the river and loch locations, the fishing flies used and the methods employed. The fishing articles may be selected for viewing by clicking on a title in the panel on the right. Note that each article will open in a new window. 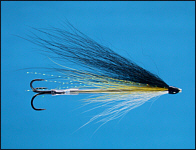 The articles are fairly wide ranging relating to a wide variety of fishing subjects, from fly tying step by step illustrations to tales of fly fishing on Scottish rivers and lochs, for salmon, sea trout and brown trout; from some thoughts on fly lines and Spey casting to the making of a wading stick; The merits of catch and release in salmon fishing. 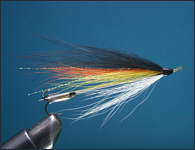 There are some articles relating to new developments in salmon and sea trout tube fly design, recently condensed into a website entitled Tube Flies; angling club waters on the Spey, Ness and elsewhere; steelhead fly fishing in North America and new tube flies to catch them; the development of the Spinhead, a new salmon fly fishing device; sea trout fishing on the Spey, Earn, Endrick and Avon; Gray's Loop, a new fly line leader loop; memories of fish and fishing places in Scotland; photographs of flies, fish and fishing locations throughout Scotland and elsewhere; salmon and sea trout catches in recent years on the Grantown association water of the River Spey; notes on the recent development of Grays Needle Tubes and Tube Flies for salmon, steelhead and sea trout fishing, developed and manufactured in Scotland by Grays of Kilsyth; a new tube fly vice, designed to hold ultra slim needle tubes, down to 1.5 mm outside diameter, the finest plastic lines metal tubes currently available commercially for fly tying; step-by-step illustrated fly tying instructions on how to tie a variety of trout, sea trout and salmon flies, for example traditional patterns like the Stoat's Tail salmon fly, Ally Gowans's Cascade, the Mallard and Silver sea trout fly, and more modern fly styles such as Scottish Shrimp tube flies, Wee Monkeys, the Fiery Cascade salmon needle tube fly, the Black & Silver sea trout tube fly, Irish Shrimp tube flies. I have also begun to transcribe my old fishing diaries (see panel to the right). A possible future for wild trout fishing in Scotland? There is a series of articles on Sea Trout Fishing, a kind of Sea Trout for Starters series (since developed into a website about Sea Trout Fishing on British Rivers), which may interest those thinking about trying sea trout night fishing, and, recently added, a few pages showing a selection of fly fishing photographs, of trout, sea trout and salmon fishing river and loch locations throughout Scotland, and some of the flies used in their deception .... and much more on a variety of fly fishing subjects.